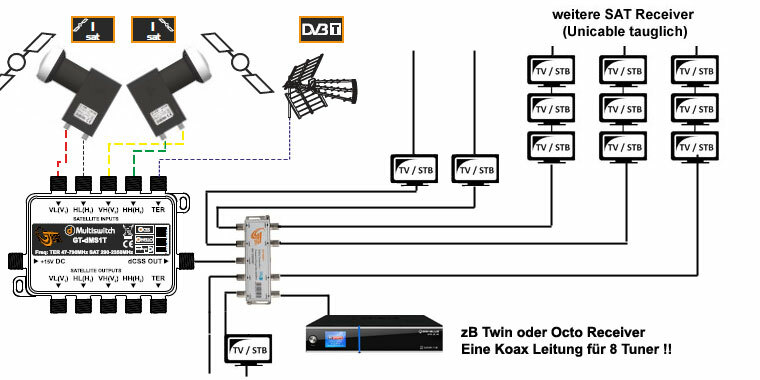 This system allows the reception of 2 satellites with only 4 coax cables coming from the SAT antenna. The two Wideband LNBs required are included in the delivery and can be used in an existing (Quattro / Quad) system Since only 4 coax cables are required from the SAT antenna to the Unicalbe multiswitch. A multiuniverse 2-way LNB mount is also included in our SET. For further grinding of the Coax line can either be one Unicable compatible SAT socket with DC-passage or a Unicable suitable SAT splitter can be used.